Today’s photo of the week is of a red-crowned parakeet/kākāriki taking a bath in a stream in Rotorua. Kākāriki, means ‘small green parrot’ in Māori. There are five main species of kākāriki. The red-crowned species is distinguished by a bright crimson forehead, crown and a streak extending back beyond the eyes. 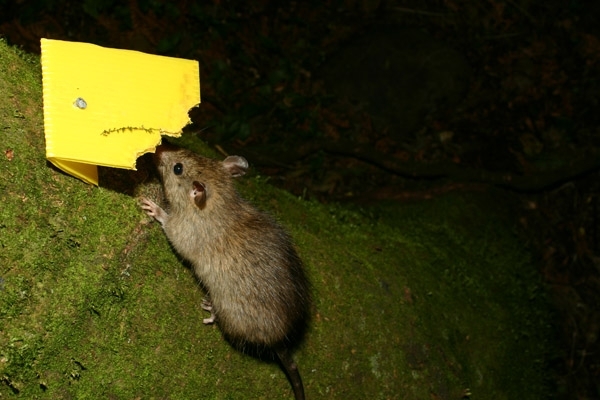 Attacks by introduced predators such as stoats and rats are the main threat to kākāriki. This photo was taken by Jackson Wood | CC BY-NC 2.0. By Amy Brasch, Partnerships Ranger, Wellington. 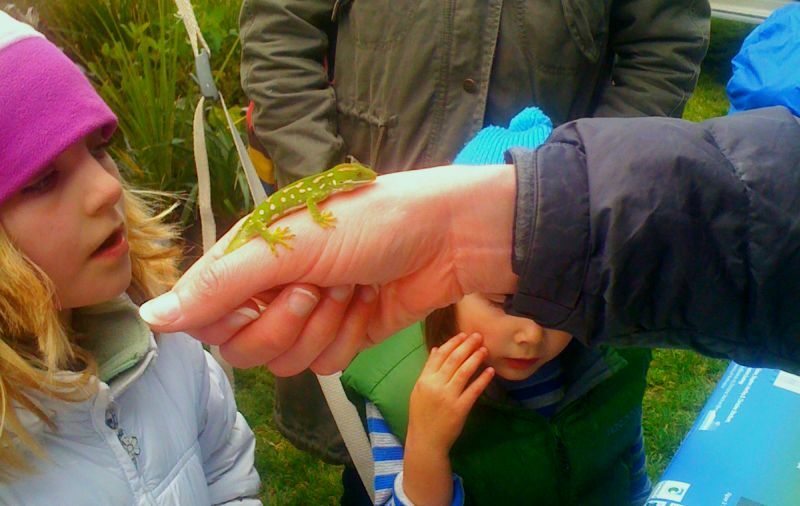 Hundreds flocked to Wellington’s Waitangi Park last month for the first annual Pest-Fest. It was a great display of various conservation partnerships in the Wellington area coming together for a common cause—educating the public on pests in New Zealand. 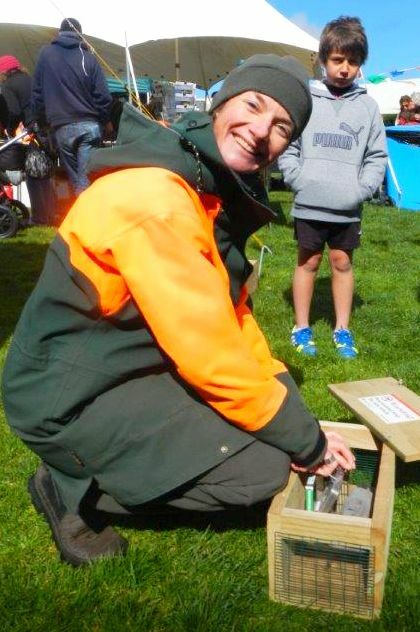 The event included a range of activities for the public, such as weed swapping, animal pest trapping demonstrations, kids’ crafts, information on current conservation research, tracking tunnel tutorials, kiwi conservation tips, advice on how to design bird-friendly gardens and much more. 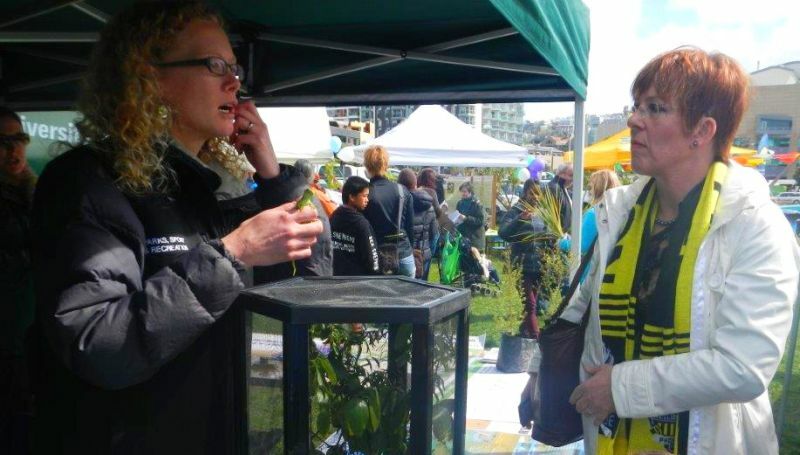 Despite being the first Pest-Fest ever held in Wellington, a wide range of organisations attended, including the Department of Conservation, Wellington City Council, Victoria University of Wellington, Zealandia, Forest and Bird, WWF and many others. It was a fantastic example of organisations coming together for conservation. 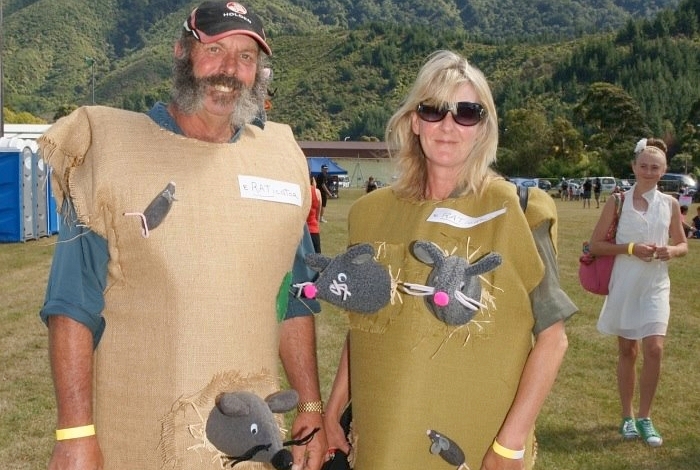 Pest-Fest was a fun way to learn about New Zealand pests. There were a lot of hands-on activities and demonstrations that really highlighted the teamwork between the various local agencies. The event ran alongside the Wellington Phoenix Community Day and the Farmer’s Market, which attracted a diverse audience. It was great to see all the different organisations in one place complementing each other and it was great to be engaging with the community on such an important conservation issue and teaching people how to monitor pests in their own backyard. 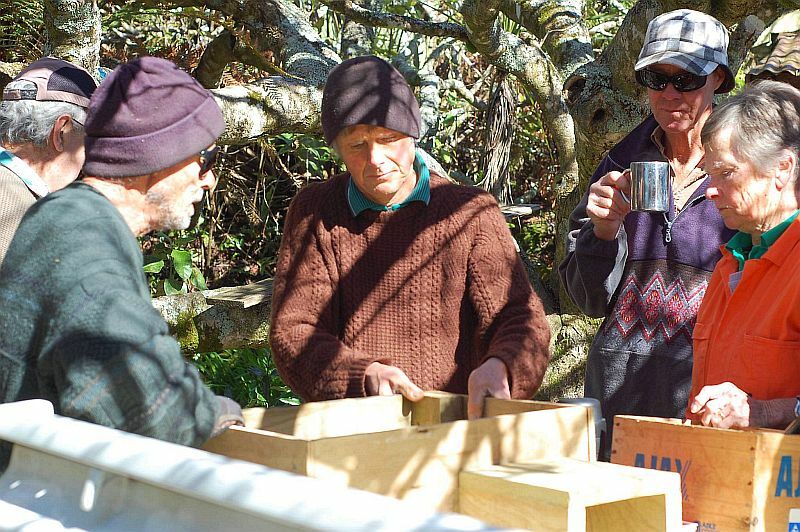 The West Coast Blue Penguin Trust have been busy building nesting boxes for the local population of little blue penguins/kororā. A nesting box ready for action! Timber and materials were kindly donated by the local Mitre 10 in Westport during Conservation Week and the Buller conservation volunteers group spent a day helping to build the new nesting boxes. These volunteers are a group set up by DOC. They meet at DOC’s Northern West Coast District Office every fortnight and go out with a DOC ranger to do a variety of work for the day—planting, helping community groups, track maintenance, historic maintenance and an array of other jobs. The volunteers helped to build ten nesting boxes. The hope is that baby penguins hatch in the boxes and are given a measure of protection against predators. 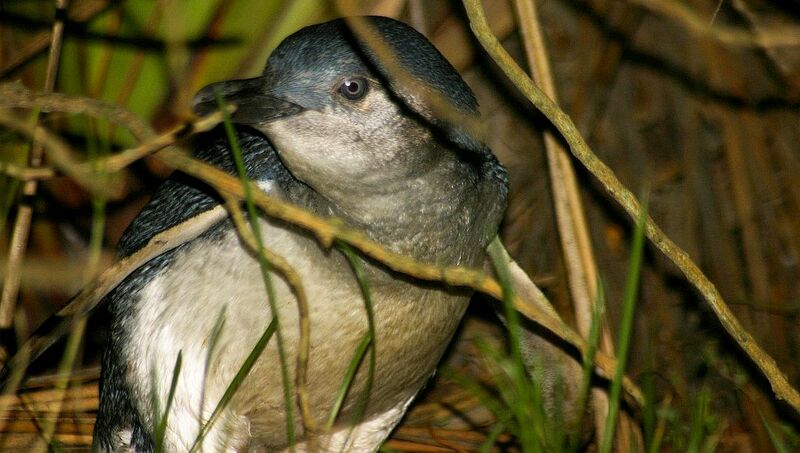 The boxes were placed out in a penguin colony at Charleston on the West Coast to create penguin homes for when the little blue penguins are nesting. The West Coast Blue Penguin Trust monitors the boxes throughout the year. It was a great day had by all, bringing together a wonderful partnership between the community, business, volunteers and DOC staff. Combine 90 excited primary school kids, two passionate DOC rangers, and an enthusiastic regional council educator. Top up with fun facts about whio and mix well. Result? A slightly chaotic but fun filled day of learning about one of our special species, the whio. 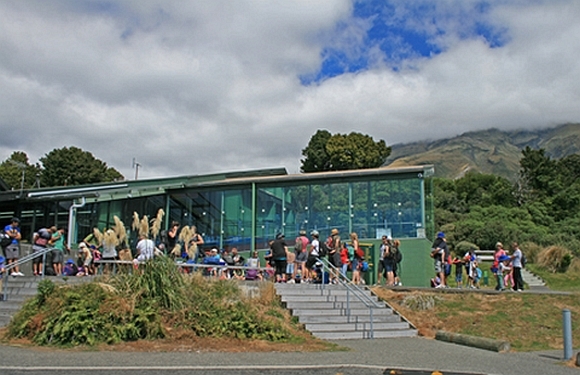 Taranaki school students recently spent a day out in Egmont National Park. As it was Whio Awareness Month DOC staff took the opportunity to share some of the work they do on the mountain to help protect the endangered duck. Biodiversity ranger Emily King usually works with whio and kiwi – so a gaggle of chattering five year olds was a whole new experience, but she soon had them captivated with cool facts about our only white water swimming duck. 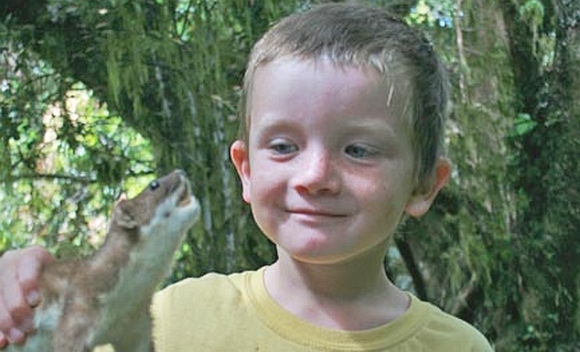 Ranger Mike demonstrates the stoat trap – SNAP! 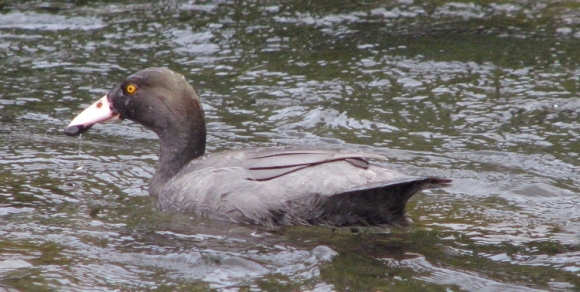 There are around 60 whio living in Egmont National Park and ongoing monitoring and pest control is key to their survival and population growth. DOC carries out this work with support from the Central North Island Conservation Charitable Blue Duck Trust and East Taranaki Environment Trust. The good news is the population is growing. 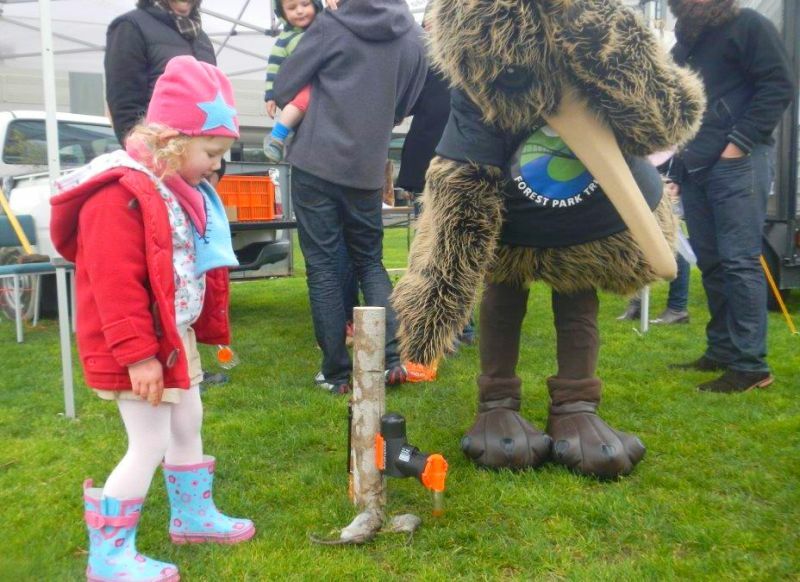 Whio Awareness Month was celebrated throughout New Zealand to recognise the “Whio Forever” project, a Genesis Energy/DOC partnership helping implement a national recovery plan to protect whio breeding areas and habitat. The idea is to double the number of fully secure breeding sites throughout the country and boost pest control to enhance productivity and survival. 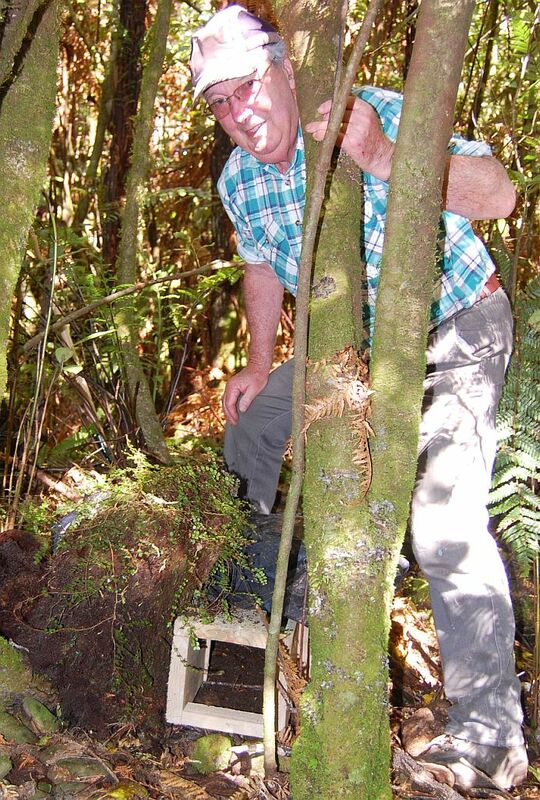 Community relations ranger Mike Tapp set up a game of predator hide and seek along a bush walk. Kids had fun finding the stoat, rat, cat, weasel and ferret hidden amongst the undergrowth, and learnt about some of the key predators of the whio and other native birds. 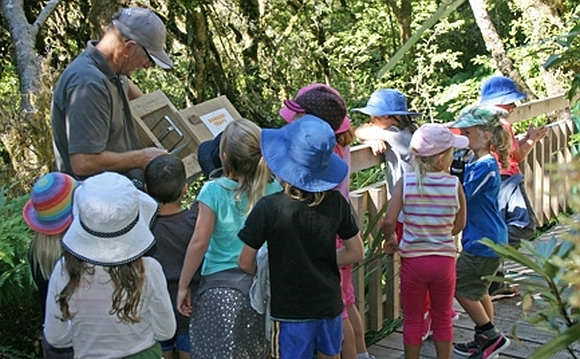 Taranaki Regional Council’s Kevin Archer took groups of children for a walk through some of the forest – pointing out where whio and other native birds might like to live. While feedback from the students was mixed and often amusing (who knew that polar bears were a major predator of whio?) some of the key messages were getting through. A whio swimming in the stream. St Joseph’s teacher Jenna Sullivan said the day had been a great success and showed how a school, DOC and the regional council can come together to create a real hands on learning experience for the kids.